On July 29, 1997, in San Diego, Richard B. Hoover of NASA's Marshall Space Flight Center announced an important finding. He had seen and photographed in the Murchison meteorite microfossils that resemble microorganisms. The fossils were seen in freshly broken pieces of the meteorite, so the chance that they were earthly contaminants is low. The chemical evidence around the microfossils is most readily explained as the result of biological activity. Leading microbiologists such as Dr. Lafayette Frederick of Howard University agreed that the forms were biological. The most interesting and unusual form, seen in many examples, curls to a tapered end. The best studied example curled further under the heat of the electron microscope, and relaxed to its former shape again after cooling. Hoover's finding was buttressed by another report from San Diego given by Robert Folk of the University of Texas. Folk and his coworker F. Leo Lynch had seen and photographed objects in the Allende meteorite that closely resembled fossils of well-known terrestrial nanobacteria (photo below) (2). Both Murchison and Allende are carbonaceous chondrites. These do not come from Mars, but from elsewhere in space — most likely they are remnants of spent comets. These new reports add strength to the previous evidence that meteorites from space (not just Mars) contain evidence of microscopic life. Hoover's results and many others of great interest were announced at the annual conference of SPIE - the International Society for Optical Engineering, held in San Diego, CA, July 28 - August 1, 1997. The complete list of the conference committee and the meeting schedule, and the complete report of the conference are available (3). 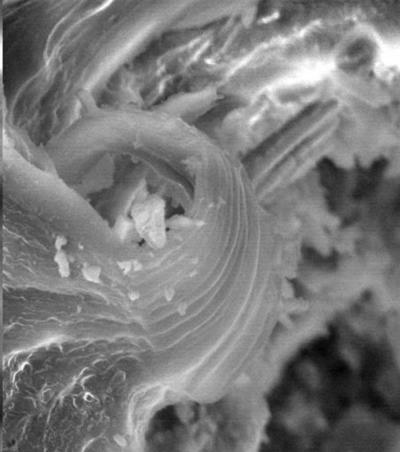 Photo of nanobacteria in Allende meteorite from article by Robert L. Folk in nauralSCIENCE, 1997. "A carbonaceous meteorite ... collected on Feb. 8, 1969 from Allende, Mexico by meteoriticist Elbert King. Grape-like clusters of nannobacterial cells (size 0.02–0.10 micrometers), bridge a pore between two olivine crystals. ...Sample courtesy of D. Smith .... of Texas. Scale bar, 0.5 micrometers." Also see What'sNEW: Nanobes. 13 Jun 2016: Meteorites contain evidence for extraterrestrial life, in spite of earthly contamination, writes Richard Hoover. Instruments and Methods to Search for Extraterrestrial Life by Richard B. Hoover, SPIE Proceedings Vol. 9606: "Instruments, Methods, and Missions for Astrobiology XVII," Richard B. Hoover, Gilbert V. Levin, Alexei Y. Rozanov and Nalin C. Wickramasinghe, eds., 9-11 Aug 2015. 22 Jan 2013: Investigation of the Polonnaruwa meteorite continues in Cardiff. Also see earlier articles, beginning 11 Jan, A carbonaceous meteorite ...contains fossilized diatoms. 6 Jun 2009: Astrobiologist Richard Hoover discusses his work in a new short video. 14 Jun 2008: Organic compounds were present in the early solar system. 5 Mar 2008: A carbonaceous meteorite collected in Antarctica contains amino acids that are predominately left-handed. Richard B. Hoover et al., "Biomarkers and Microfossils in the Murchison, Rainbow, and Tagish Lake meteorites" [abstract], p 15-31, SPIE Proceedings Vol. 4859: "Instruments, Methods, and Missions for Astrobiology V," Richard B. Hoover; Alexei Y. Rozanov; Roland R. Paepe, eds., 26 Feb 2003. A. Yu. Rozanov and R. B. Hoover, "Biomorphs in Carbonaceous Chondrites" [PDF abstract], 32nd Lunar and Planetary Science Conference, Houston TX, 12-16 March 2001. Fossils found in Victorian meteor, by Vanessa Williams, Victoria Sun-Herald, 18 December 2000. Fossilized Bacteria in Murchison and Efremovka, a CA webpage containing 6 photos was posted 27 January, 2000. ...Arctic permafrost may hold clues to life on other worlds — Richard Hoover and other members of a combined US - Russian team will go to Siberia to seek clues about possible life on other cold icy planets. By Dave Dooling, Marshall Space Flight Center, 27 July 1999. 1999, April 17: A conference, "Instruments, Methods, and Missions for Astrobiology II" will be held in Denver, Tuesday-Thursday 20-22 July 1999. 1997, December 13: A portion of the SPIE 1998 annual meeting will be devoted to... "Investigations of terrestrial extremophiles...."
Richard B. Hoover, Fred Hoyle, Chandra Wickramasinghe, Miriam J. Hoover and S. Al-Mufti, "Diatoms on Earth, Comets, Europa, and in Interstellar Space," PDF: 5Mb, p 19-45 v 35, Earth Moon and Planets, D. Reidel Publishing Company, 1986. Richard B. Hoover, "Those Marvelous, Myriad Diatoms," PDF: 2Mb, p 870-878, National Geographic, June 1979. 1. Richard B. Hoover, "Meteorites, Microfossils, and Exobiology" [abstract] in Instruments, Methods, and Missions for the Investigation of Extraterrestrial Microorganisms [contents], Richard B. Hoover, Editor, Proceedings of SPIE Vol. 3111, doi:10.1117/12.278766, p 115-136 (1997). 2. Robert L. Folk and F. Leo Lynch, "Nanobacteria are alive on Earth as well as Mars" [abstract], in ...Proceedings of SPIE Vol. 3111, doi:10.1117/12.278795, p 407-419 (1997). 3. ...Proceedings of SPIE Vol. 3111, (1997), Published by SPIE —The International Society for Optical Engineering, Bellingham Washington.